A NEW BOOK ON THE LEGENDARY PRODUCER REVEALS A PERFORMER WITH CHOPS OF HIS OWN. T Bone Burnett at the 17th Annual Americana Music Festival and Conference in 2016, in Nashville. Still, others might know Burnett exclusively for his TV and movie soundtracks. He’s worked on three Coen Brothers films: The Big Lebowski, O Brother, Where Art Thou? and Inside Llewyn Davis. Then there’s Crazy Heart and Walk the Line. Not to mention the TV series True Detective and Nashville, created by his second wife, Callie Khouri. But what many people don’t know is that Burnett, an Oscar and Grammy winner, has had a brilliant solo career, spanning around a dozen releases since 1980. Bringing that to light was part of the inspiration for the new book T Bone Burnett: A Life in Pursuit, by the Chicago-based journalist Lloyd Sachs, who will host a talk at BookPeople on Saturday. Burnett did not make himself available for the book but Sachs, who has written extensively for the Chicago Sun-Times and No Depressionand has a previous book titled American Country: Bluegrass, Honky Tonk and Crossover Sounds, has interviewed him in the past. Each of the chapters in T Bone Burnett, published by the University of Texas Press, addresses a different identity of the enigmatic subject. This includes Burnett as Svengali to his first wife, the singer-songwriter Sam Phillips, as she transitioned from a Christian to a secular musician. The book also refers to Burnett as a “Dylanologist,” because of his shared history with Bob Dylan, from playing guitar in Dylan’s Rolling Thunder Revue tour in ’75 and ’76 to recording Dylan songs on Lost on the River: The New Basement Tapes, in 2014. Then there’s Burnett’s life as an activist, fighting against licensing legislation and advocating for musicians to get their proper monetary dues. 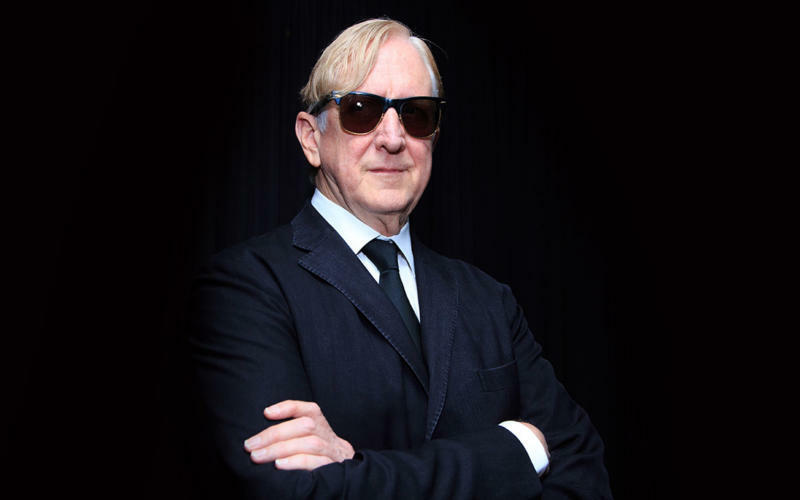 T Bone Burnett was born Joseph Henry Burnett III in St. Louis, in 1948, but he grew up in Fort Worth. As a teenager during the British Invasion, he gravitated to the Beatles because they experimented with sounds. He was also a blues hound, scarfing down Jimmy Reed and Muddy Waters. Perhaps his biggest influence, though, was his childhood schoolmate and friend Stephen Bruton, best known for playing in Kris Kristofferson’s band. Bruton was a guitar whiz whose skills informed Burnett’s. 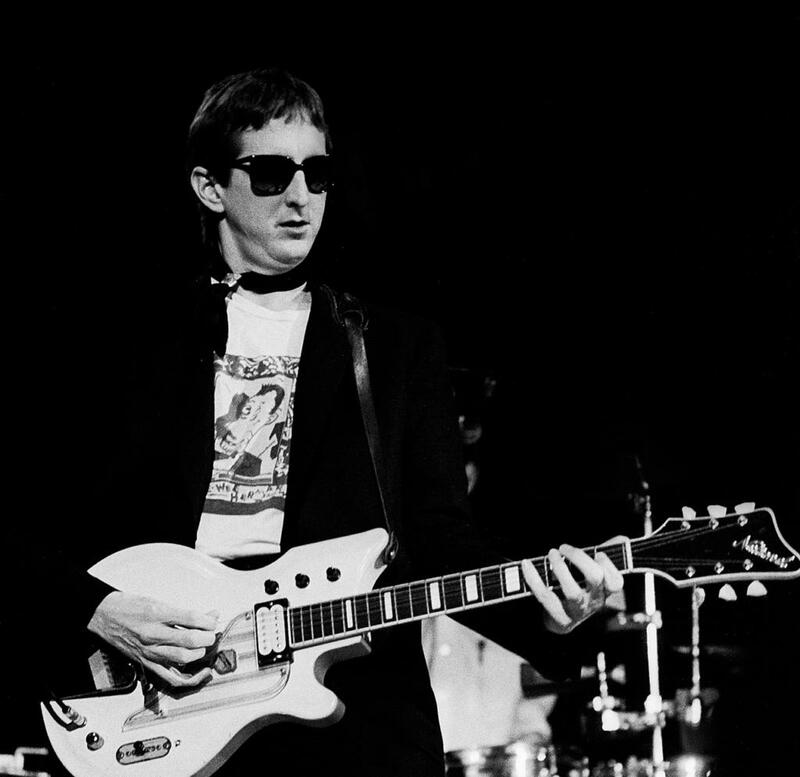 T Bone Burnett opening for the Who at the International Ampitheater on October 5, 1982, in Chicago. The impact Bruton had on Burnett extended to Bruton’s dad, who owned a record store called Record Town. At the store, Burnett got hip to arcane acts like the pre-blues singer Dock Boggs, whose song “Oh Death” would become a lynchpin for the O Brother, Where Art Thou? soundtrack, which was a hugely influential album that more or less birthed the Americana genre. The two old friends would pair up again later in life, when Bruton was gravely ill, to collaborate on songs for Crazy Heart. After graduating from Paschal High School, Burnett attended Texas Christian University for a spell, where he was in the ROTC, but dropped out to start working as a producer at Sound City, also in Fort Worth. He plucked the Legendary Stardust Cowboy off the streets and recorded his novelty hit “Paralyzed.” He also helmed the cult album The Unwritten Works of Geoffrey, Etc., by the psych-folk band Whistler, Chaucer, Detroit and Greenhill. (A former member of the group, David Bullock, will join Sachs in discussion at BookPeople.) These early experiences laid the foundation for the singular approach Burnett adopted later in his career as a producer. 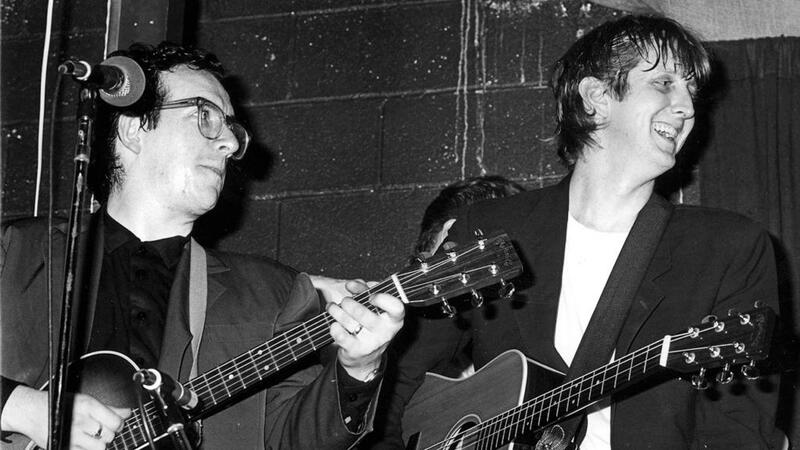 Burnett (right) with Elvis Costello (left) at McCabe’s Guitar Shop, in Santa Monica, California, in 1984. Burnett eventually moved to Los Angeles, where in 1972 he released his first solo album, The B-52 Band & the Fabulous Skylarks, under J. Henry Burnett. A couple of years later he went on tour with Dylan. After that he formed the Alpha Band, featuring fellow players in Dylan’s Rolling Thunder Revue. The Alpha Band had a religious sensibility that would inhabit Burnett’s future work. In 1980, under the now well-known moniker T Bone Burnett, he released Truth Decay, which many consider his proper debut. With a combination of blues, folk, and country, Burnett served up parables and tales of personal struggles. As time wore on, elements of noir, spawned by the works of the mystery writers Raymond Chandler and James Ellroy, pervaded Burnett’s work. And surrealism and biting social commentary in his lyrics became the standard. However, an exception to that is his eponymous 1986 album. Stripped down and recorded over a few days in an all-acoustic setting with some Nashville session players, the album features Burnett singing from the heart. Songs like “River of Love” showcase Burnett’s ability to deliver deeply felt songs of his own.